African Jerk Marinade for sale. Buy online at Zingerman's Mail Order. Gourmet Gifts. Food Gifts. Jainaba Jeng creates full-flavored sauces inspired by the cuisine she grew up with in West Africa. 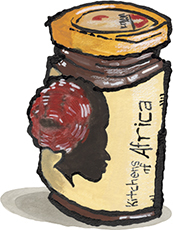 Now in North Carolina, her company, Kitchens of Africa, has turned loads of foodies onto the incredible complexity of the flavors from the land she left behind. Her jerk paste marinade is a crackling combination of sweet dates, tamarind, paprika, Dijon mustard, ginger, garlic, habaneros, and an array of spices that add fuel to this culinary fire. It’s got heat, it’s sweet, it’s tart, smoky, bright, and strangely addictive. Cut with olive oil and use as a marinade or finish grilled chicken, pork, or veggie dishes with a dollop or two. "This was the best sauce ever, and I'm still sweating 10 minutes after I finished eating. I'm loving it!!"